Magic Leap, the $2 billion 3D software startup, is finally live. It doesn't come cheap. Magic Leap, the secretive Plantation, Fla.-based tech company that has raised more than $2 billion in venture capital to build sophisticated 3-D software, has finally gone live. Wednesday, the company announced its first product is now available for purchase. But the average computer user isn't about to rush out and buy it. The Magic Leap One Creator Edition is being marketed to "developers and creators" at a retail price of $2,295. It's available online only in select cities. The package comes with software and a headset that lets users add layers of computer-generated images and applications to the world around them. 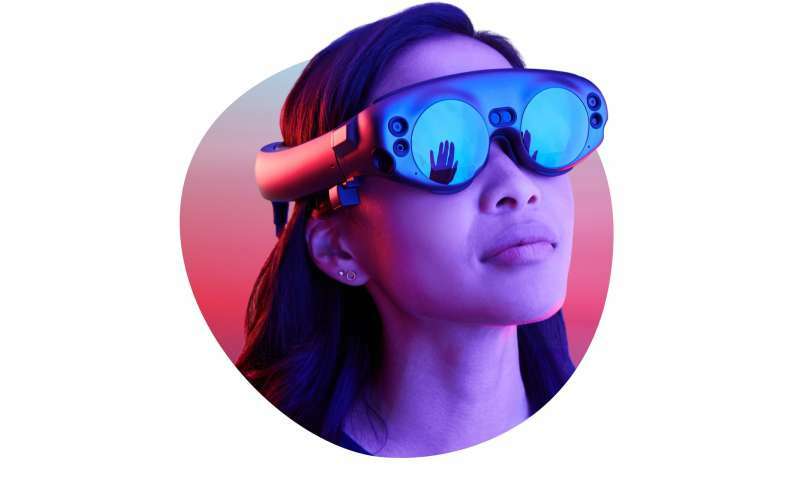 It also includes a web browser and a social platform to connect with other Magic Leap users. The result: common programs like email and videos "float" in the real world in front of the user, reports CNBC, which got a preview. "You aren't tethered to another computer," writes CNBC's Todd Haselton. "You can walk around freely (though I felt a bit weird with it on my head since it's like trying to walk around with swimming goggles on). "It's hard to explain what it's like using Magic Leap, a problem the company has admitted." Wired Magazine, which also got an early look, noted glitches..
" ... It wasn't great at first," Jessi Hempel reports. "The headset was beautiful, and unlike others I've tried, it felt light on my head. A disc-size battery and computing pack, built like a small CD, fit easily in my front pocket. A main menu popped up in front of me, the field of view large enough that it didn't seem narrow. "But as great as this was, there were glitches. When I tried to use the hand controller to navigate to a football demo, the controller didn't respond; the experience appeared frozen." Founder Rony Abovitz hailed the announcement's importance for Florida, which has pledged more than $8 million in subsidies to support the company. At last year's eMerge America's conference on Miami Beach, Abovitz said there were now approximately 800 Magic Leap employees in South Florida. The company's website still lists dozens of openings in Plantation. With its numerous venture funding rounds totaling billions, the company, founded in 2010, became South Florida's most buzzed-about startup of the decade. "Florida has always been a blank canvas for innovation, and we hope to be one small part of that incredible story," he said in a statement. "Our launch of Magic Leap One Creator Edition begins the next chapter of our journey to empower creators in Florida, the U.S., and around the world. This is a joyful moment for all of our employees, and we look forward to working with a diverse and forward-thinking set of developers, artists, creators, and businesses right here in Florida and everywhere." Magic Leap's viability had been questioned by observers after the company experienced delays and lawsuits, including sexual harassment and trade secrets complaints, - and a negative review by Beyonce, who reportedly found the version she tested boring after she got a sneak peak around the winter of 2016-2017. In an interview with Wired published Wednesday, Abovitz said he regretted the hype that led up to the product rollout. "I think we were arrogant," he said. But the company still has plenty of believers. Last month, AT&T took a stake in the company that valued it at $6.3 billion. gosh dirk, since you have a better business plan to offer? I am astonished that you have not yet announced the roll-out of your splendid invention. I am surprised that Magic Leap is offering One Creator Edition at only 23 hundred dollars. I was expecting it to be priced a lot higher with all the included bells & whistles. I presume ML isn't fooling around and intends to go straight to dominating the mass market with consumer pricing. Try and wall in as much of the consumer base as possible before competitors can flood in knock-offs. Also at such a low-price point, make it more difficult for would-be competitors to profitably enter the market. Leaving the ones with good ideas vulnerable to deep-pockets takeover bids. Magic Leap has a SUPER NAME! Jump into A COMPUTER World! Whoopee! The Product reviewers say "Errr... this isnt too great... Err... It's buggy"
A buggy, not great first product release!!! Woopeee? Just proves that some dudes can get 80 million dollars with good enthusiasm and lame technology. Let's see if they blow it entirely on zero return, or if they manage to keep some technological worth from investment of that 80 million? like even a 2 million profit would be amazing. The reviews are pointint towards 1,000 units sold, that's about 2000,000 dollars. 78mn to go guys! "Buggy" in new products is to expected. Just ask Elon Musk. Hold a seance, ask Steve Jobs! When you were a newborn, did you go straight to using a toilet? Or were you powdered and diapered? The road to perfection is a twisty mobius of blockades and pitfalls, unforeseen misses and frequent potholes. An endless quest for the unattainable. Magic Leap.....watch that 2 billion disappear.